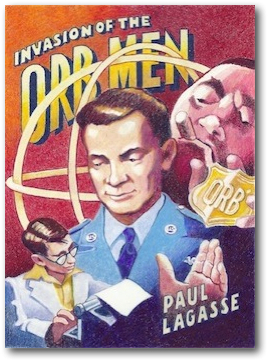 This free sample of Invasion of the Orb Men by Paul Lagasse is provided with the compliments of Channel 37. If you enjoy it, please support the author by purchasing the e-book using the links at the end of the sample. USUALLY, THE EYEWITNESSES OF the strange objects spinning through our skies are the subjects of this magazine’s articles. However, this time it is your faithful correspondent who finds himself enmeshed in the enigma of the saucers — in a most thrilling and terrifying way! Regular readers of Flying Saucer Weekly will remember our coverage of the Southwest Saucer Flap two months ago (“Dozens See Giant Object Cross Southwest,” in the April 10th number), in which was described a series of reports by many credible eyewitnesses — including a police officer and a flying instructor and his student — of a large silver-white cone-shaped object that blazed a trail high above Texas, Oklahoma, and Kansas on Wednesday, January 18, 1952. The article generated much reader response, both from others who had seen the mysterious giant silver sphere but had been afraid to speak up for fear of ridicule, and from people offering their opinions and theories as to the nature of the object. But all of these responses paled in comparison to the visit your correspondent received from a terrifying stranger who threatened him to be silent about flying saucers! It was a bright Monday morning two weeks ago when a knock on the door revealed a black-suited and -hatted agent from a mysterious and unknown organization called ‘The Orb.’ The agent, who was alone, beckoned your correspondent outside, toward his black Cadillac. Fearing he might be preparing to abduct me, I wisely chose not to approach but rather to stand in the middle of the yard. There, we spoke — or, more precisely, the mysterious man in black did all the talking, and warned me in the most threatening tones about the consequences of revealing the secrets of the Southwest Saucer to the unsuspecting public. To make his point, the mystery visitor revealed factual details about the giant sphere that I had uncovered but did not include in the article! The agent refused to divulge either his name or the nature of the organization for which he claimed to be working, though he wore a badge with the name “Orb” in English letters. From this clumsy maneuver, I surmised, perhaps the visitor had accidentally let slip his true nature — could he in fact have been a representative of an alien organization, imperfectly briefed on how to hide information from humans? In these perilous times, threats can either turn away the cowardly or they can entice the brave to continue seeking answers. Your correspondent has opted for the latter course . . .
Creeger looked at the cover sheet accompanying the clippings. “Miss Mackenzie, it’s enough to just clip these stories for me and the analysts. You don’t need to type up summaries of each one, you know.” He waved the stack. She handed Creeger a fresh pack of Wrigley’s Spearmint. “Thirty seconds in the door and you’re already saving my life.” Creeger stuck the pack in his breast pocket. Miss Mackenzie appeared in the doorway with two fresh cups of coffee. “Thank you. You’re a lifesaver. Again.” Creeger took his cup with him as he moved behind his desk and sat down. Langford thanked Miss Mackenzie as he took his cup in turn and sat back down in front of Creeger’s desk. Creeger massaged his temples, which were already throbbing. His eyes drifted across his desk to the Toby jug where he stashed his fountain pens — a ceramic rendition of a pugnacious Winston Churchill, a gift from an English farmer into whose field Creeger had belly-landed his B-17 after a bombing mission to Germany, with two engines aflame and half a tail missing. That was already six years, and another war, ago. When he had been recalled to active duty two years earlier, in the rush immediately following the North Korean army’s crossing of the 38th parallel, Creeger had expected to be assigned to Davis-Monthan or maybe even MacDill — the sprawling air bases constituting the front lines of Strategic Air Command. That was where the thundering herds of B-36 intercontinental bombers grazed, and where the latest gleaming silver swept-wing Boeing Stratojets would soon be roosting. Where, in other words, modern bomber pilots went to war. Instead, Creeger had been surprised to find himself assigned to a desk job at the Air Technical Intelligence Center at Wright-Patterson Air Force Base, in suburban southwest Ohio — about as far from a front-line base as if he had been assigned to a radar picket station in Nome. He had been even more surprised to find his new commander was General John Horn, who had commanded the bomb group that included Creeger’s squadron. After V-E Day, “Black Jack” Horn had stayed in the service and earned his second star while Creeger had gone back to his old job at West Central Airways. Horn had admitted to Creeger that he pulled some strings to get him assigned to take over the Air Force’s investigation of the then-new flying saucer phenomenon. At their first meeting Horn had poured on the charm, praising Creeger’s analytical skills. Things like speed, distance, and altitude, are easy to misinterpret even for an expert. You look up and see something roar overhead at high speed, you don’t have time to make precise calculations. You get an impression, and afterwards your imagination fills in the blanks. That’s why I need you, Len. You know the difference. You know when to trust what you’re seeing, and when to suspect it. You’d be surprised how many people can’t do that. It was a masterful sales pitch, and Creeger found he couldn’t say no to his old boss. So he pulled together an excellent team of civilian analysts, found Miss Mackenzie to keep the paperwork in order, and for two years they had been doing good work against some long odds. Creeger was proud of his team, which over time had become as tightly knit and reliable as his old bomber squadron. That’s why Friday’s meeting had felt like more than just a change of assignment. It had hit Creeger like a personal betrayal. Creeger waved his cup in disgust. “He did, at first. You remember how much discretion we used to have. Budget. Staffing. Hell, even more filing cabinets on demand. But apparently the Pentagon didn’t think we were returning the favor, and now they’re turning the screws on him. And so now you’ll have to go and find yourself a real job. As for me, I still have a year before I can get back to West Central Airways.” He put down his cup hard enough to splash the last dregs. Langford wiped an eye. “Clears up?” Creeger was smiling despite himself. “I won’t ask.” Creeger’s laughter was interrupted by the sound of tapping on his office doorframe. Both men looked up. Miss Mackenzie stood in the doorway. “Certainly, sir.” She closed the door behind her. Creeger drained the rest of the scalding brew in a single draft. “Died of a heart attack about three months later. Wife, two kids. Bastards.” The memory of Carolyn Blakely’s blank expression during the graveside service caused Creeger to shiver. She had been so heavily sedated she couldn’t comfort her two sobbing boys. Creeger’s headache didn’t go away, so he stood and poured the rest of the coffee into Langford’s proffered cup and his own. The two men sipped in silence. Creeger feigned shock, and Langford chuckled on his way out the door. Want to read more? Buy it on Kindle or Smashwords for just 99 cents!